Mason Airfield proofed difficult to find. 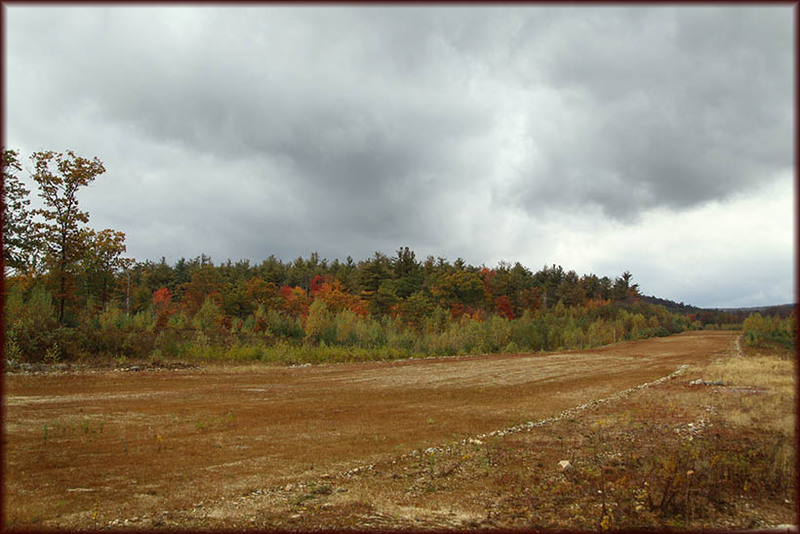 I passed a small road twice, before I decided this by-road (which soon turned into a dirt road) had to bring me to the airfield, which I knew could be viewed from the 'main road', NH13. I came to a fork in the 'road', opted for the left fork, continued past a dumpsite (I think) and stopped to turn around, confused. At that point I backed the car into a gate, to answer a call of nature. Standing at the gate, I looked out on the DC-3! The gate was closed, but I found it easy to pass around it. Mason Airfield (FAA identifier NH76, see www.airnav.com) is privately owned by Mr Michael 'Mike' Farrey. 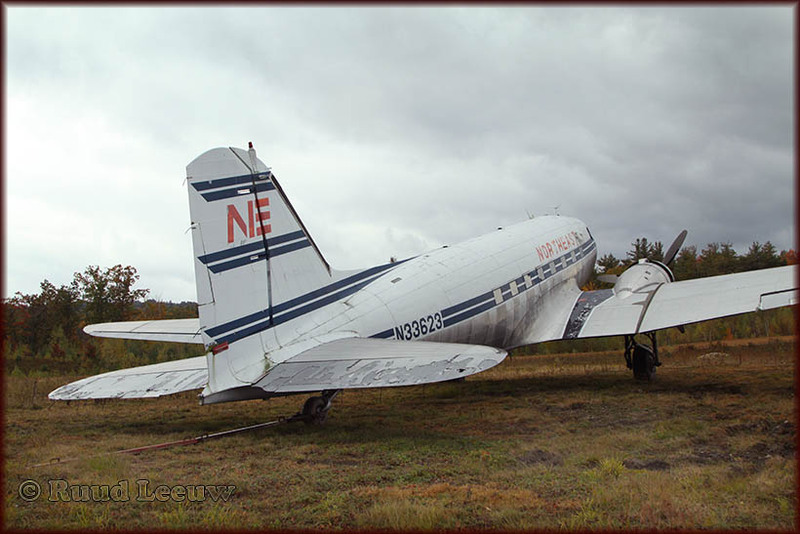 The C-47A N33623 (c/n 20215) has been registered to the Dakota Aviation Museum of Mason,NH since 17Sep93 and is -afaik- flown by a Delta pilot, Mike Hart. 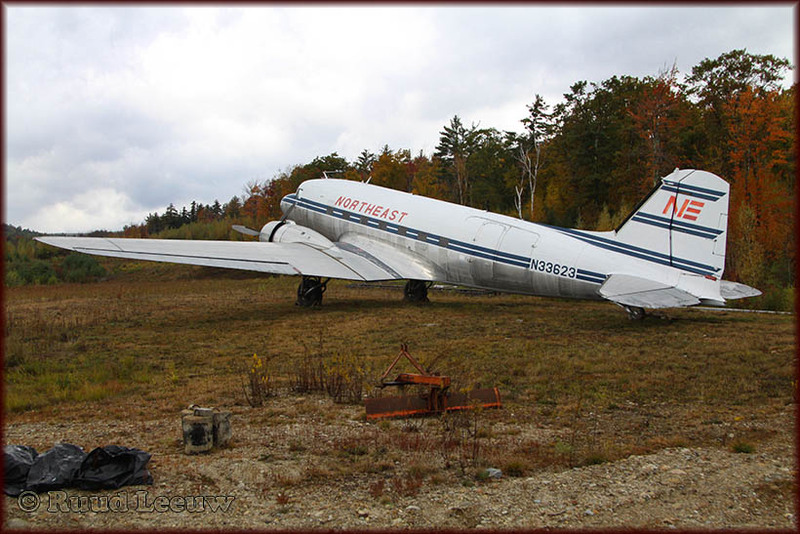 But as these photos will show, the condition of this Douglas DC-3 is somewhat to be desired and it may well have been grounded for a number of years. The hangar seems to have been recently added, so better times may be looming ahead! 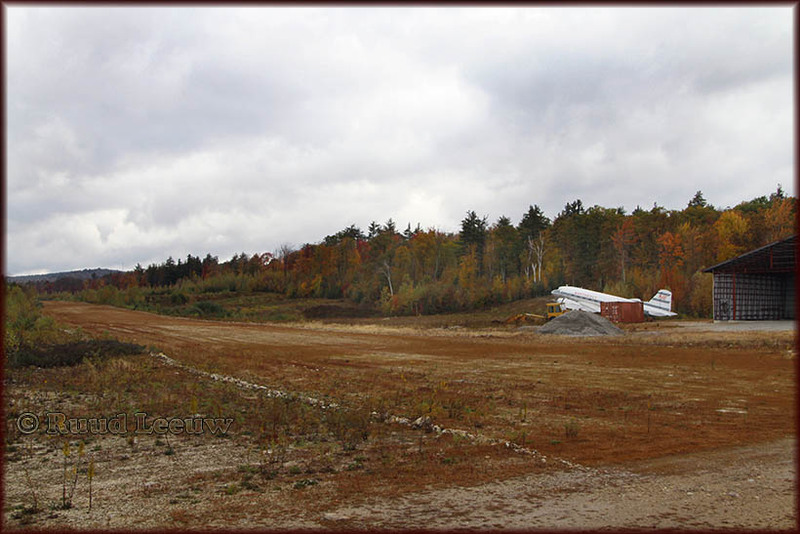 No facilities, just a dirtstrip (05/23, 2700 x 100 ft / 823 x 30 m) in the woods of New Hampshire. Approaching the Douglas DC-3, I had to be careful not to step in muck or pools of water. I don't think N33623 has been moved for quite a while. Delivered with serial 43-15749 on 04May44 to the USAAF, but soon -01Mar46- transferred to the Reconstruction Finance Corporation (RFC, see Wikipedia). Its first entry in the civil registry was as NC20754 for David B. Oliver and operated for the Allegheny Air Cargo Inc., of Pittsburgh,PA (1947). Next was Morrison Knudsen Co. of Boise, ID (28Apr54). 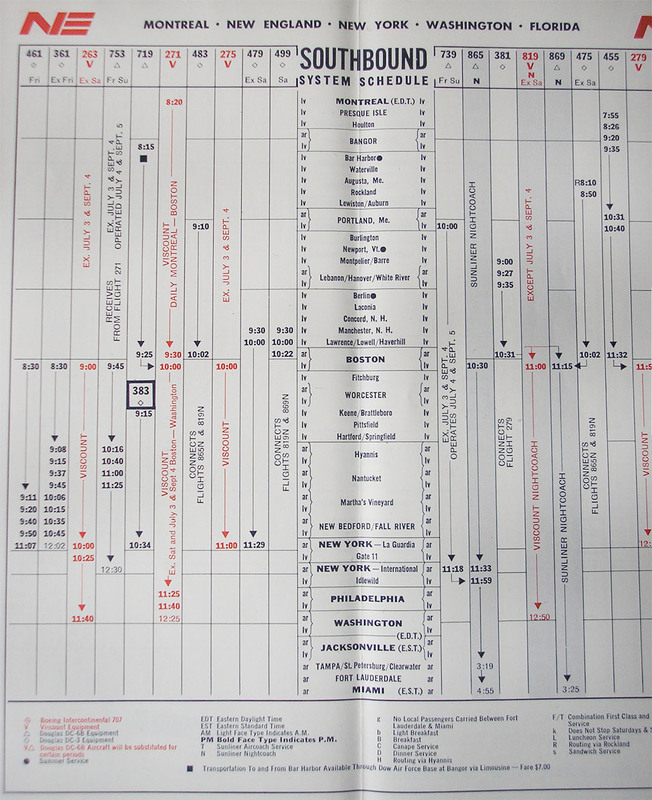 In 1963 it was reregistered to N36MK. 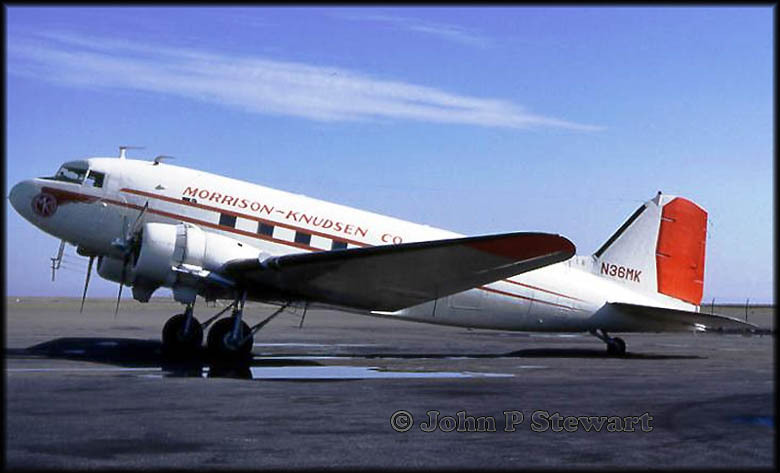 John P. Stewart wrote, as soon as I published this page: "After reading the post about the Northeast DC-3 in New Hampshire, I thought I had shot the aircraft when it was in service with Morrison-Knudsen... So here is a photo I took at San Francisco (SFO) in -I think- November of 1965!" 12Feb69, as N364K, it was registered for Denver Beechcraft Inc and in July 1969 it was operating for Pacific Inland Nav. Co. Empire of Oregon. Travelling north, to Anchorage, Alaska it was flown by Alaska Barge & Transport Inc (Oct.'69). 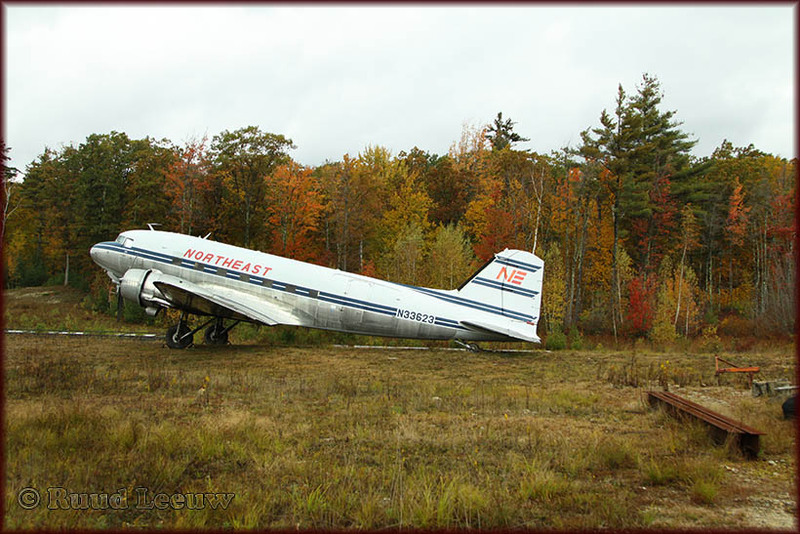 By May 1972 it was operating for Aero Retardant Inc. of Fairbanks,AK. And Pacific Alaska Airlines was next, in Nov73. Entering Canadian registry as C-GYBA it was acquired by Aircar Services of Vancouver,BC. Yellow Bird Air leased it for a period from 13Apr76. Registry was amended for Skycraft Air Transport Inc. of Oshaway during May 1984. Tt returned to the US again, initially registered as N347AB, then for the Dakota Aircraft Museum as N33623 on 17Sep93. The majority of these fellows will purchase a Cessna 172 or 182, although the more adventuresome will seek out something more unusual, such as a piper J-3 Cub or a round-engine Cessna 195. 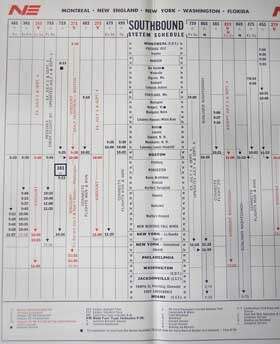 Those who seek long distance transport may explore Cessna 310s or Beech Barons, outfitted with the latest GPS, moving maps, and other such electronic equipment normally associated with the cockpit of an airliner. Then there is Mike Farrey. Mike retired in 1994 from Delta Air Lines as a Boeing 767 captain based in Boston. Coincidentally, his career had begun in East Boston in 1966 as a co-pilot on a Northeast Airlines Douglas DC-6B, only narrowly missing the opportunity to fly NEA's DC-3s. 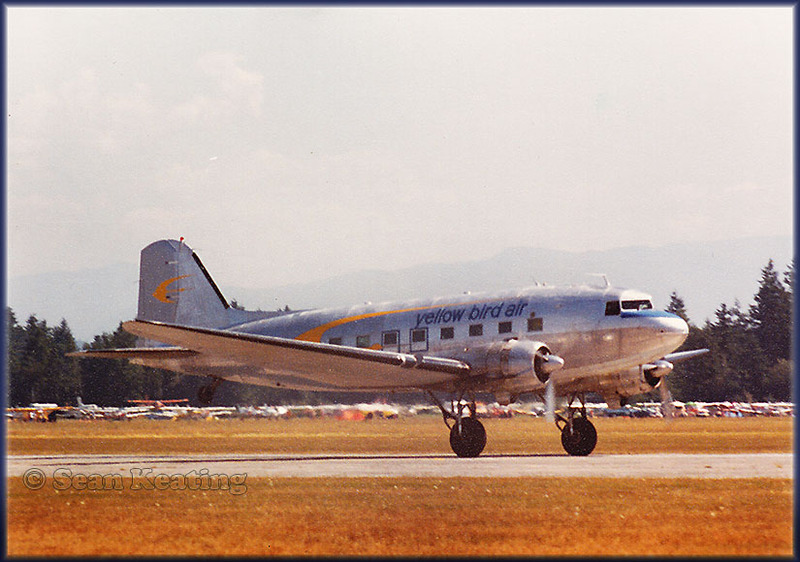 NEA operated a fleet of 25 DC-3s over 26 years and operated its last DC-3 trip on December 16, 1966. 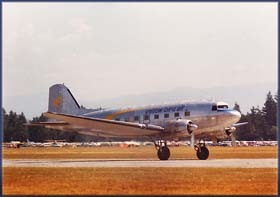 The airline's DC-3 pilots had been 'frozen' on the type, thus Mike and other new hires went directly to the four-engine DC-6, pending the arrival of jets. The years 1966 and 1967 were busy ones for training at Northeast as the company took delivery of 21 new Boeing 727s, 14 DC-9s, and eight Fairchild-Hiller FH-227s. 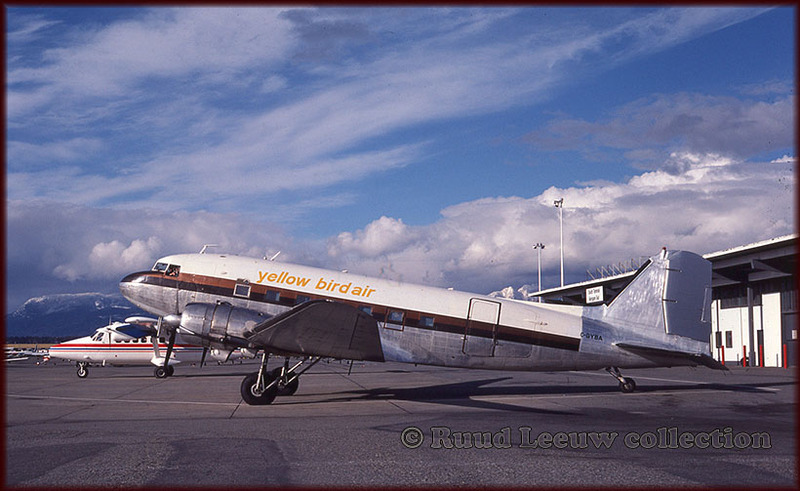 I found c/n 20215, as C-GYBA of Yellow Bird Air, in my collection of slides. I purchased this slide from Per Schmidt at some point, unfortunately the slide had no info of where and when this image was taken. Per bought the slide from someone else, unable to determine the name of the photographer. But Sean Keating offered the following suggestion: "I would suggest this photo was taken in Vancouver at the South Terminal... Note the mountains in the background! Taken during the days when you could park your car on the grass and just walk across the ramp to take a photo, and nobody bothered you! Given that the paint stripping is not complete, I first saw C-GYBA in 1980 and it was all silver with yellow striping by then, and the Twin Otter (Air BC or AirWest?) in the background may help date it..? My initial guess is late 1978 or '79." "I would say the location is Vancouver South Terminal and I would suggest the date is late 1979 or early 1980. I have a slide dated August 1978 in similar colours but the tail was painted in Pacific Alaska colours. So, in short (...) the photo was taken between August 1978 and April 1980! - but I would say that my more exact estimate above is not far off." "As a matter of interest, this aircraft was based at Innotech Aviation in Vancouver-YVR, where I worked on the ramp. I used to have a lot to do with it - fuelling, GPU, etc. I see in my log book that I had 4 flights in it: 27/12/80, at night from Vancouver to Penticton BC and return, to deliver some supplies because roads were blocked due to snow/flooding - 25/07/81 from Vancouver to Port Hardy and return - a passenger charter." 2. Abbotsford Air Show, Aug 1980. I think 'YBA was taking up the skydivers to open the show." 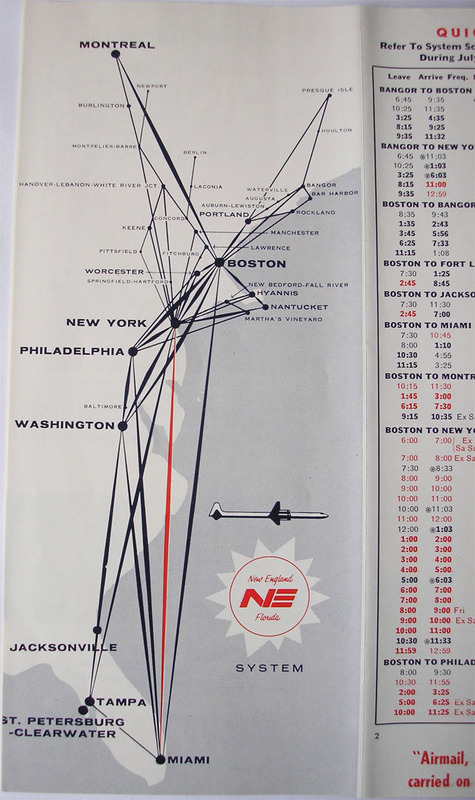 From Maine to Miami they became known as the 'Yellowbird' fleet and a nemesis to the much larger, Miami-based Eastern and National Airlines. 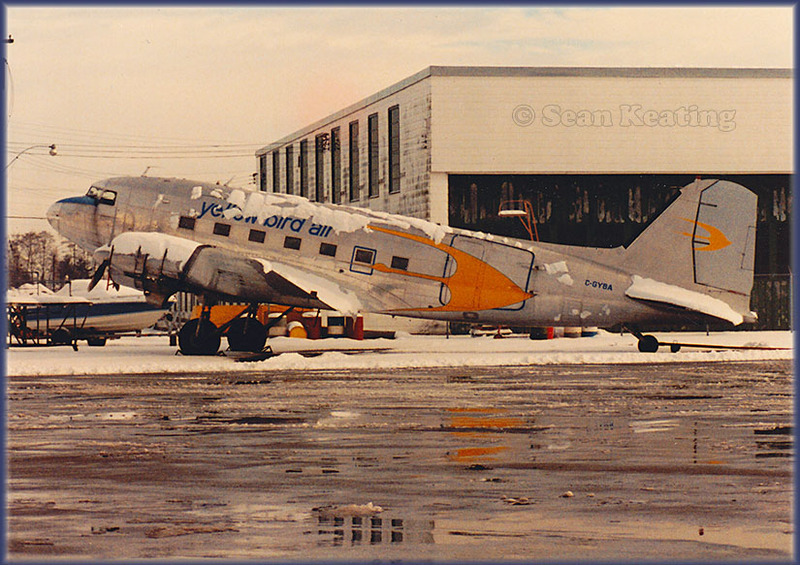 Shortly before retirement, Mike had been bit by the DC-3 bug and learned of three available airframes, plus spares, located at Oshawa, Ontario, approximately 30mi (50km) east of Toronto. After many trips north to Canada and much negotiation with Skycraft Air Transport over a period of a year, his bid on all three aircraft and spares was accepted. He had intended to purchase just one. But Skycraft was adamant, it was an all or nothing proposition... As far as Skycraft was concerned, the aircraft were an eyesore, with flat tires, peeling paint, missing engines and various other parts, and leaking oil on valuable ramp space. The company gave Mike six months to remove them, expecting that he would bring in flatbed trailers, pull the wings, and haul them away. Mike, however, is an adventurer and a romantic, and could see past the oxidized, oil streaked cowls. He viewed his 'fleet' with pride and earnestly planned another course of action. Unfortunately it was already September, which gave him only three months to accomplish a formidable task. "We started work in shorts and tee shirts, graduated to sweatshirts, and ended up in down parkas, boots, and gloves," Mike recalls. Two of the three airframes had been previously US registered, which expedited the ferry permits issued from the Buffalo, New York, GADO, and flustered the executives at Skycraft when they learned that these hulks were flyable after all. In Canada, they had the registrations C-FRTB, C-GSCB, and C-GYBA, and Mike re-registered the trio in the US as: N345AB, N346AB, and N347AB, respectively. After months of work that included numerous engine and propeller changes, Mike and his crew flew his ragtag fleet of C-47s to Reading, Pennsylvania, one at a time, as they became airworthy. To meet expenses, 345AB (MSN 13803) was sold to the Sunliner Air Museum in College Park, Maryland, although today the airplane is parked at Plattsburgh, New York. 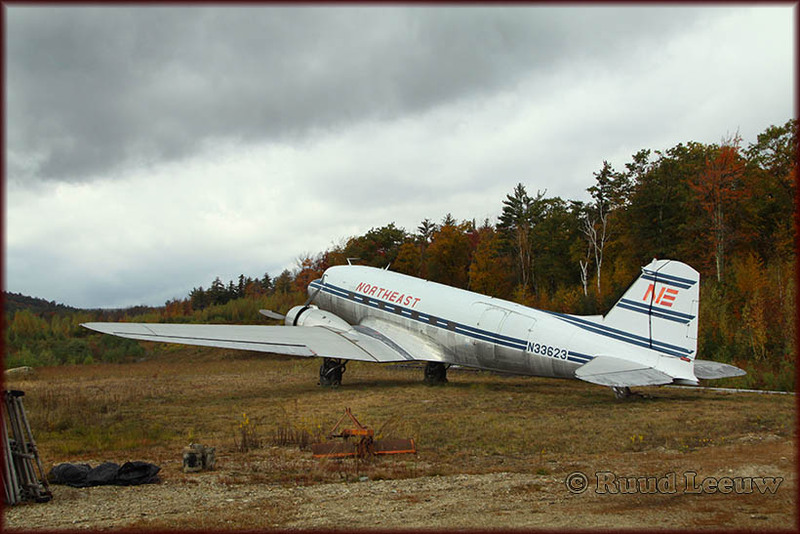 A second, 346AB (MSN 16693/33441), was given to Doug Sellix, of DKI Aviation Services in Reading, for his assistance in making the airplanes airworthy, and has since been sold for use as a freighter out of Detroit-Willow Run, Michigan. Doug had further assisted Mike with a detailed maintenance program, all the registration paperwork, and trained him for his DC-3 type rating. All this was accomplished as the Canadian weather deteriorated and Mike flew his schedule at Delta Air Lines. Mike admits, "My wife thought I was crazy, but I saw it as my last great adventure.". The remaining C-47, 347AB (MSN 20215), had been built in Oklahoma City and delivered to the US Army Air Force on May 4, 1944, with serial number 43-15749. Having seen only light military duty, by 1946 she was declared surplus and passed to the Reconstruction Finance Corp which sold her to the Morrison-Knudson Company in 1954. She was plushly outfitted with a Remmert-Warner executive interior, including couches and four swivel chairs. Based in Boise, Idaho, she flew all over the West Coast for the construction company as N20754, later as N36MK, until MK sold her to Denver Beechcraft in 1969. Mike, who has all the airplane's logbooks, says that the Morrison-Knudson logs are beautiful leather-bound books that include passenger manifests. From 1969, she suffered the fate experienced by many veteran C-47s, that of continually serving a new operator. Eventually, after tours in Oregon and Alaska, she landed in Canada in 1976and flew for several more. Not looking quite as plush as in her MK days, Mike and his son Andy departed in N347AB eastbound from Reading on June 8, 1995, en route to Nashua, New Hampshire. 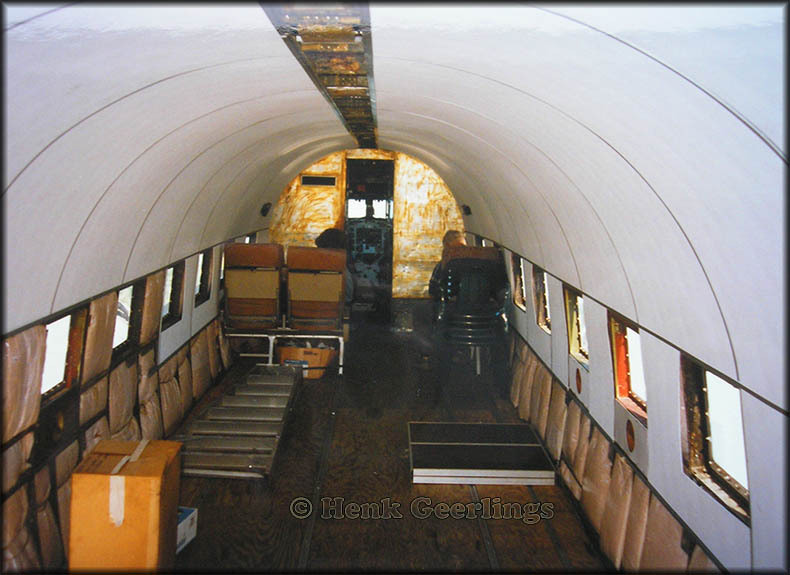 This is where her restoration to a DC-3C would commence, with the help of Gene and Karen Benson at KeyFlight Academy. 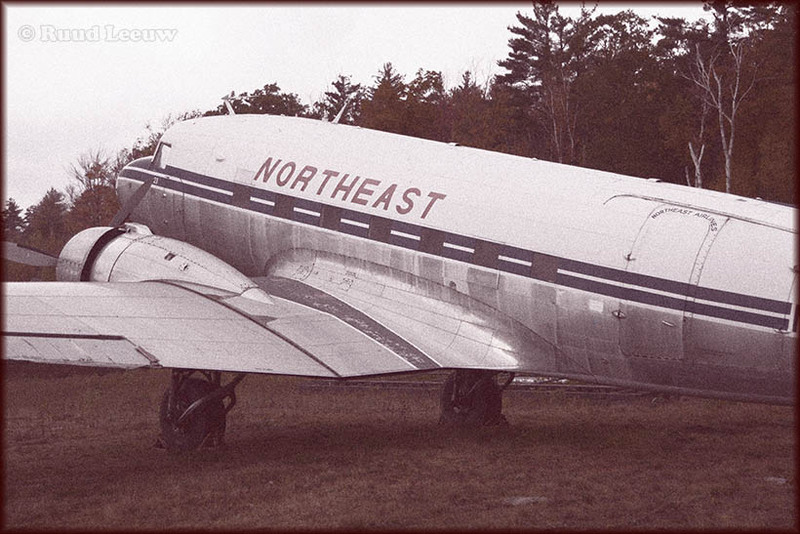 Later, Mike moved the airplane to Plattsburgh, NY, where, with the help of maintenance director Bob Houghton and owner Jim Droulette at CommutAir, the job was completed. 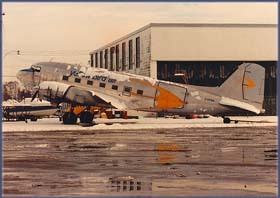 They rebuilt the floors, including the beams, applied new boots and brakes, and painted her in a 1952 Northeast Airlines livery, the last red, white, and blue scheme before the Yellowbird campaign. "Without Bob, Jim, or the Bensons," Mike states, "this project wouldn't have happened." 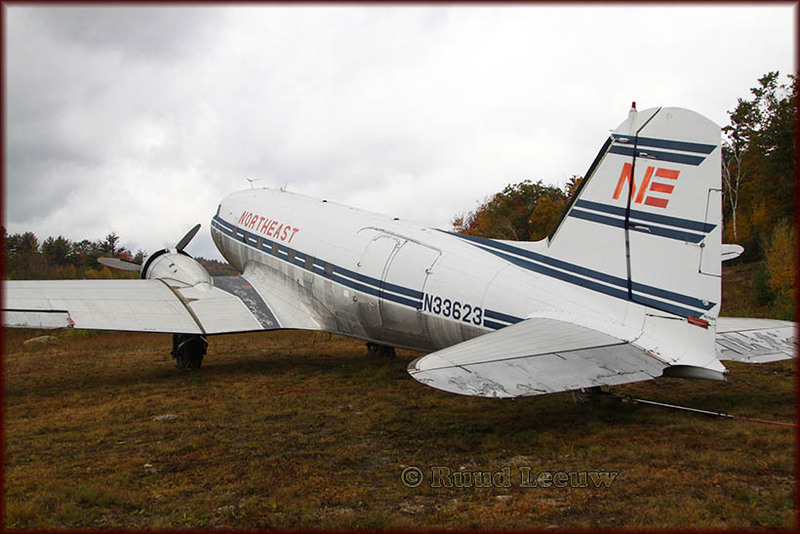 The airplane was also re-registered N33623, a number that had seen duty on a NEA DC-3. Over the past two seasons, the very energetic Mike Farrey, with the help of a loyal corps of volunteers, has flown N33623 to more than two dozen New England and New York air shows. He has become a regular at the Owls Head Transportation Museum in Maine, and No 23 has flown twice from New Hampshire to Florida to appear at the EAA's Sun 'n Fun Fly-In. The Three has also been flown to several New England airports at the request of historical societies to generate interest in local aviation and its colorful past. Wherever the Three journeys, she attracts enthusiastic crowds with endless stories about flying into Montpelier, Manchester, Nantucket, or Portland in driving snow or thick fog aboard a Northeast airliner. Presently (! ), N33623 is based at Hampton Airfield on the New Hampshire coast. 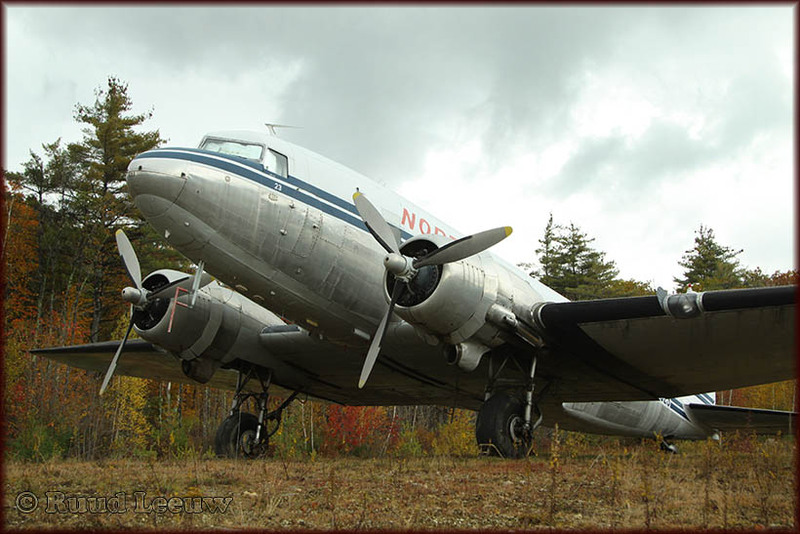 Hampton, active since 1945, is owned by another Northeast / Delta pilot, Mike Hart. It is a busy 2, 100ft (640m)-long grass strip that sees J-3 Cubs as well as other antique airplanes, such as a 1930 New Standard Biplane that is employed to carry sightseers. 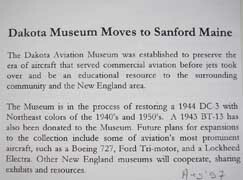 The DC-3 is the focal point for The Dakota Aviation Museum, a non-profit entity founded by Mike Farrey to collect and display artifacts associated with propeller driven airliners. "There are many museums devoted to warbirds, but relatively few promote the history of airliners," Mike explains. 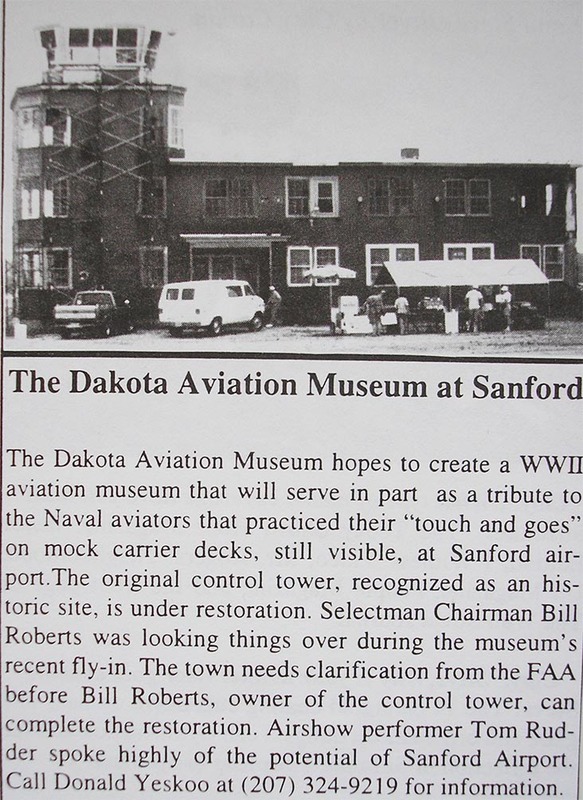 In search of a permanent home with display and hangar space, Mike hopes to attract school groups, scouting organizations, and researchers as regular visitors to encourage interest in airline history. 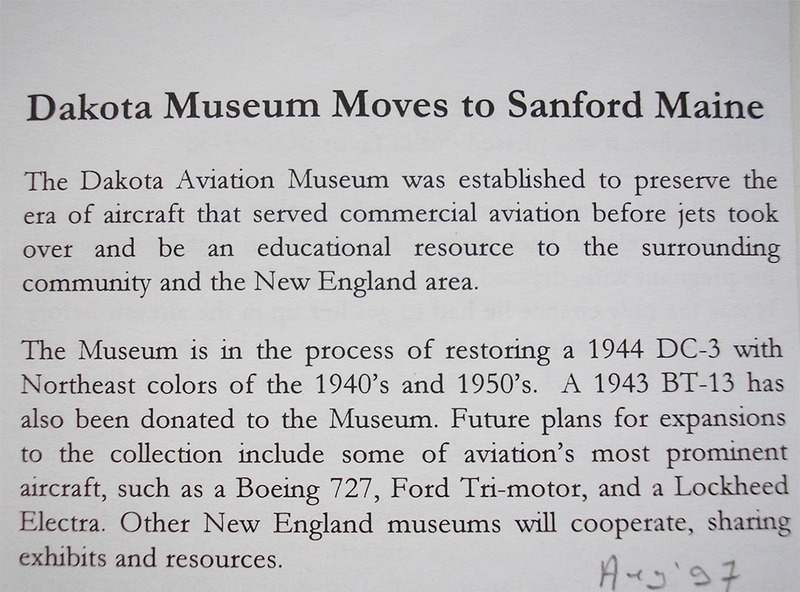 Future acquisitions for the museum, which currently has 80 members, may include a Convair 240 and a Lockheed Constellation. If you have an interest in vintage airliners and airline history, Mike Farrey is cheerfully looking for new individual and corporate members. Still a proud airliner which, with better accommodation and some polishing, could be made to look real grand! 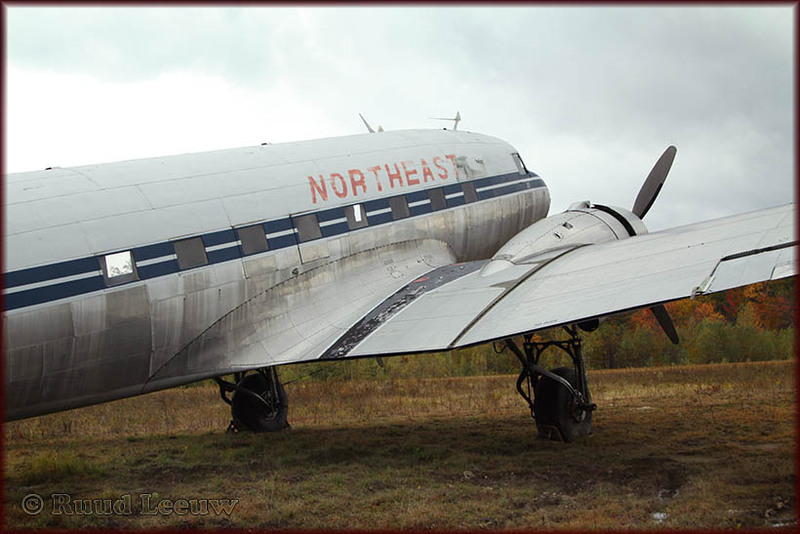 One cannot but admire personal initiatives to restore and preserve such classic airliners! The isolated location of this airfield, not visible from the road, and the lack (?) 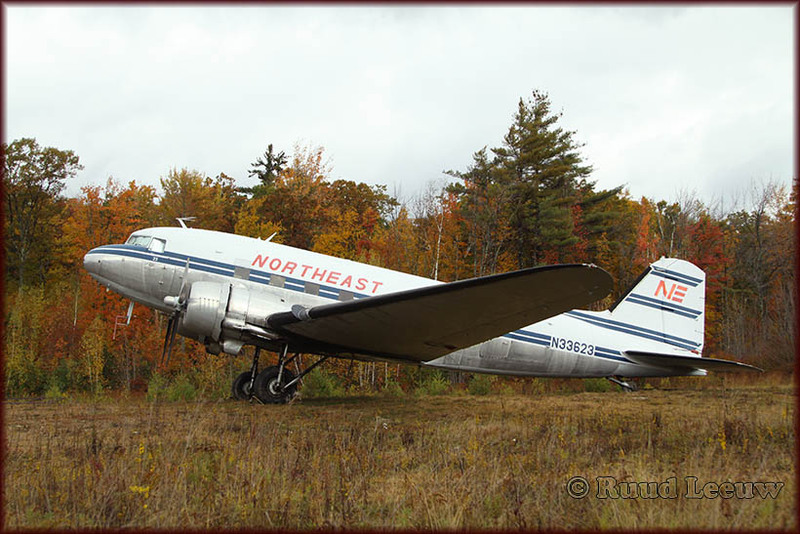 of recent flying activity by this Douglas DC-3, may explain why images of N33623 are comparatively rare on the internet. 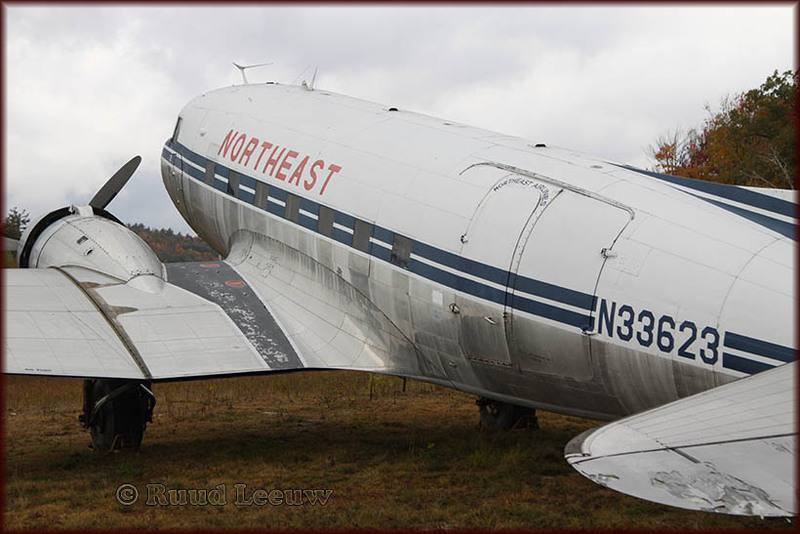 Note the bedraggled condition of the tailsection, the climate here in New Hampshire must be devastating... Hopefully she will be towed soon in that recently erected hangar, snow had fallen in the mountains already. 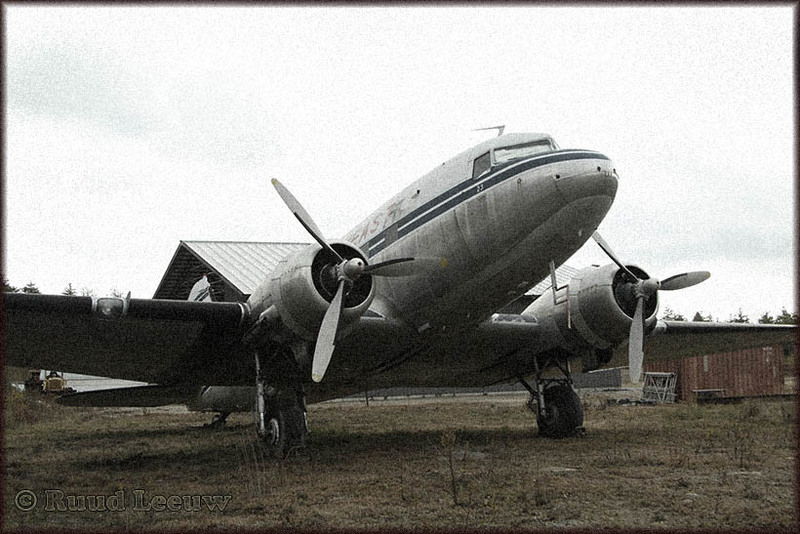 Henk Geerlings got in touch with me, noticing how I photographed this DC-3 here. 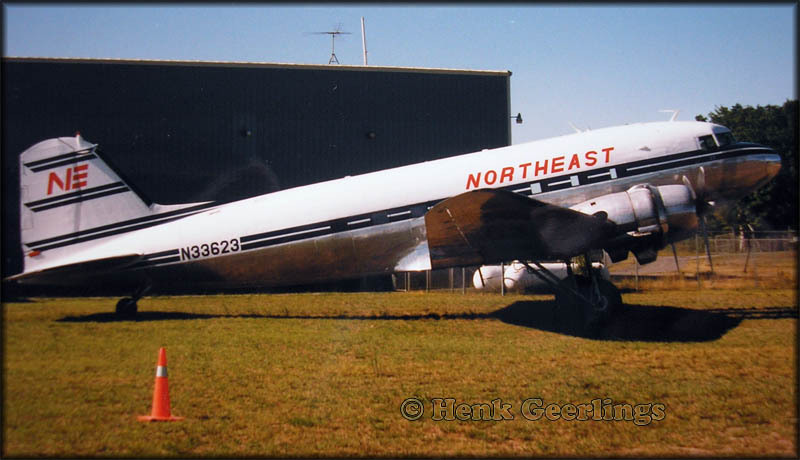 Henk wrote: "Came across your story about N33623, the DC-3 of Northeast Airlines. I came across N33623 on 25Aug 1997, and was allowed to photograph it inside out. Donald Yesko was so kind to offer me this opportunity (A few years ago he visited Amsterdam and I took him to visit the DDA Airlines)." 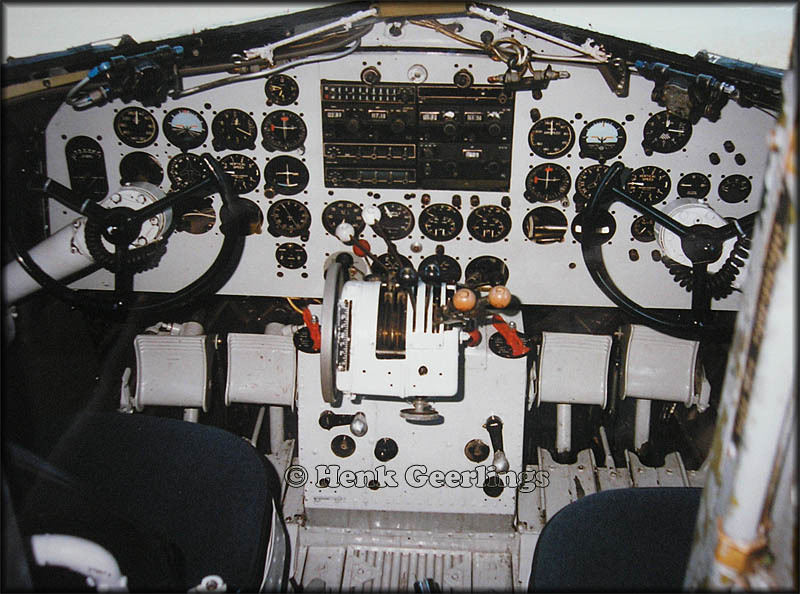 Cockpit of N33623 in 1997. Rand Peck provided me with a very welcome update (feedback on my laborious write ups and ones shared personal memories are always most welcome!) on a DC-3 at a rather remote location. 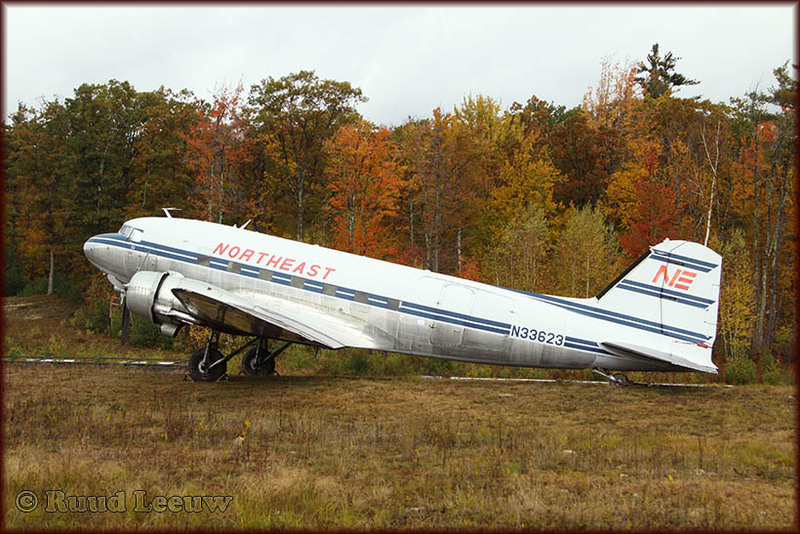 He wrote: "Unfortunately, Mike Farrey's DC-3 (N33623) in Mason,NH still languishes in the same position that you last saw her. I flew her many times with Mike, visiting air shows throughout New England; she was a beautiful machine! Thanks very much for the inspiration to get out and see more." 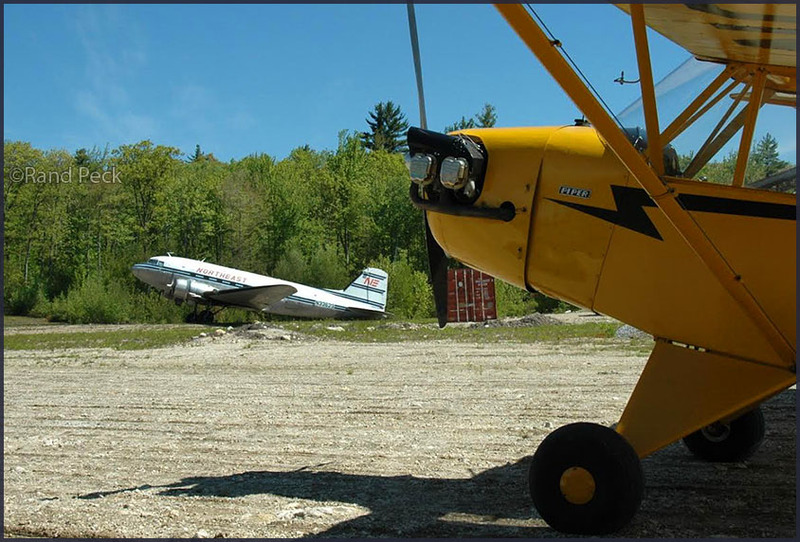 Rand Peck's 1946 J3 Cub at Mason,NH with N33623. Date 25May2008. 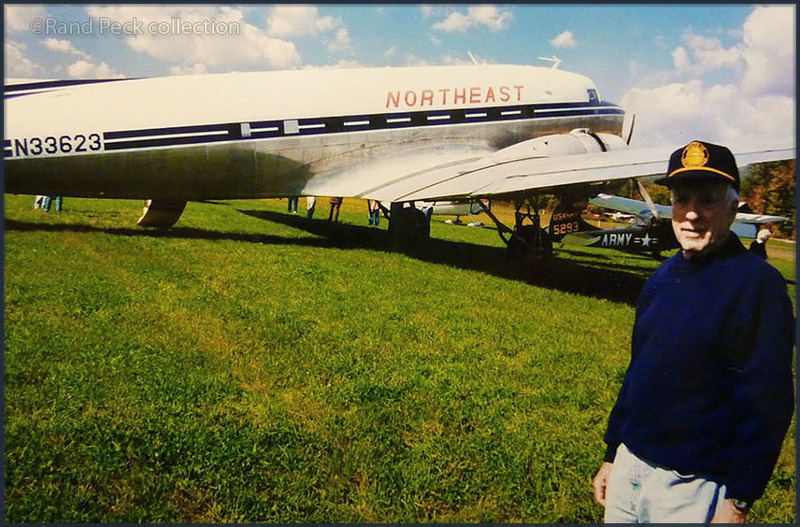 Rand Peck standing by N33623 at the Hampton Airfield in Hampton,NH. May 2002. 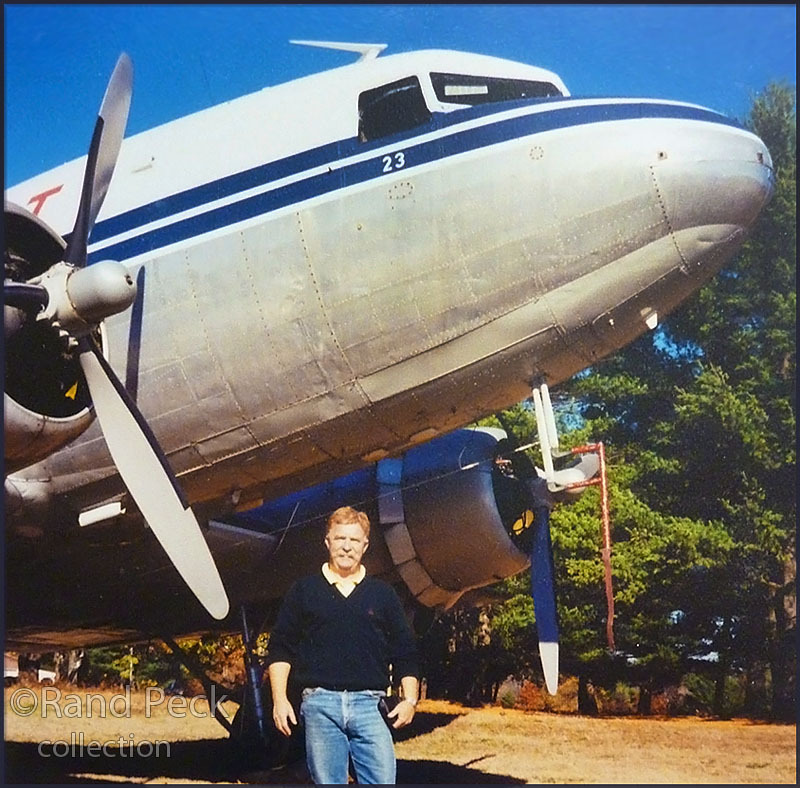 Retired NEA/DAL captain Bob Mudge, author of Adventures of a Yellowbird', with DC-3 N33623 at Plymouth,NH. This was at the NEA reunion. Date unknown, probably summer 2004.